This weekend was our last trip home to my mom and dad's until after Logan makes his debut into the world. Besides family, I haven't missed a lot of the "small town" things about my hometown or neighboring cities until now. We arrived a little before 7 and sure enough, Papa Tom was outside sitting under a tree with the dogs waiting for his little man. We jumped out of the car and Kaden began his adventures. He explored every nook of the fenced in yard and when that was done he headed straight for the gate and unlocked a whole new world. No six-foot privacy fences staring down at him, no streets with racing cars on them-just wide open spaces and it was all his. He ran, he fell. He pushed his motorcycle, he fell. He kicked his ball, he fell. Yes, falling was a constant but so was the smile he had on his face each time he got up. When it was time to come in, he even brought me flowers-he takes after his daddy quite well. 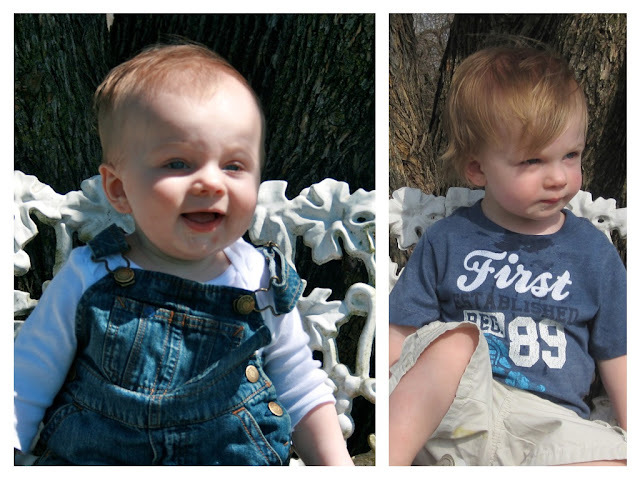 Luckily for Kaden, Sunday brought more great weather and some cousins to play with and less falls. Papa Tom decided to make his famous burgers and homemade french fries and before we knew it, the entire family was coming over. 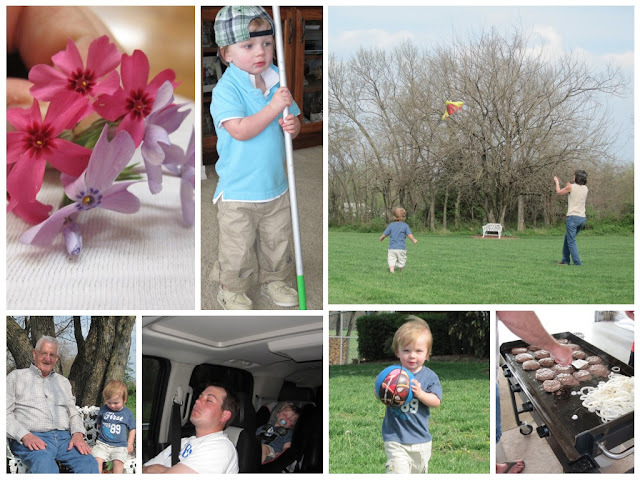 The kids played kickball, hid Easter Eggs, threw the football and flew a kite. I was not looking forward to saying goodbye and taking Kaden away from his new found freedom but the time came and we loaded back up for home. We can't wait to go and visit again and I can't wait to see both of the boys running along side one another in a few years. 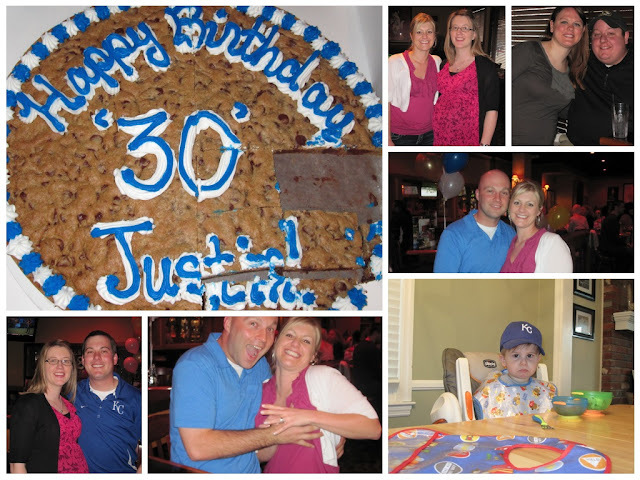 Daddy's 30th Birthday! Cousin Colton wasn't too happy when he found out he couldn't join the fun. The weekend might have been filled with lots of highlights but there were a few low notes too. For starters the air conditioner broke on Saturday (Kaden and I were already gone so Daddy had to deal with the heat). Lucky for us, AB May came right over and fixed our issue and the house was on its way to cooling down. Normally, we would just open up the windows to cool the house down, it is still a little early for the air conditioner but Kaden has allergies-the worst case they have seen all season so far. Last week I took him to the doctors and we walked out of there with 3 prescriptions and an order to start the breathing treatments again. No windows open at home, no windows down in the car and baths every night. So a functional air condition was a must! Just as AB May was leaving a gust of wind came through our backyard, lifted the patio umbrella up into the air and when it fell, it fell right back on top of the table and shattered the entire glass top. 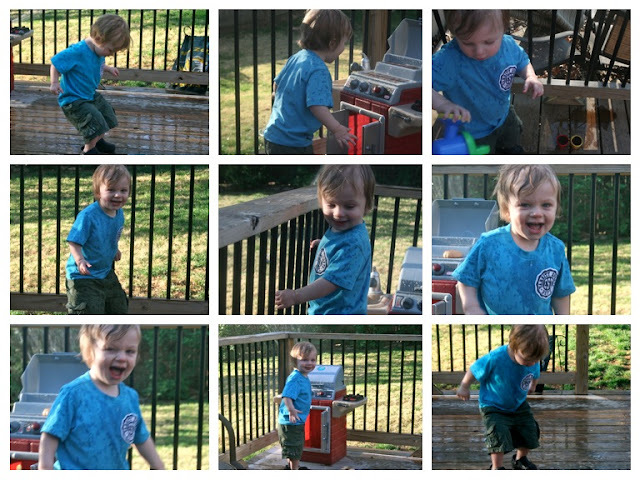 Sadly, our favorite pastime is grilling and being on the back deck but Kaden didn't seem to mind the missing table one bit, in fact, he kind of liked not having to run around and dodge chairs. Daddy got out the sprinkler and started watering the grass and Kaden, well he was a little excited. Time to Play at Chick-fil-A! Meet the NEWEST family member!